Space Shuttle Endeavour (Orbiter Vehicle Designation: OV-105) is a retired orbiter from NASA's Space Shuttle program and the fifth and final operational Shuttle built. It embarked on its first mission, STS-49, in May 1992 and its 25th and final mission, STS-134, in May 2011. STS-134 was expected to be the final mission of the Space Shuttle program, but with the authorization of STS-135, Atlantis became the last shuttle to fly. The United States Congress approved the construction of Endeavour in 1987 to replace Challenger, which was destroyed in 1986. Structural spares built during the construction of Discovery and Atlantis were used in its assembly. NASA chose, on cost grounds, to build Endeavour from spares rather than refitting Enterprise or accepting a Rockwell International proposal to build two Shuttles for the price of one. The orbiter is named after the British HMS Endeavour, the ship which took Captain James Cook on his first voyage of discovery (1768–1771). This is why the name is spelled in the British English manner, rather than the American English ("Endeavor"). This has caused confusion, including when NASA itself misspelled a sign on the launch pad in 2007. The Space Shuttle carried a piece of the original wood from Cook's ship inside the cockpit. The name also honored Endeavour, the Command Module of Apollo 15, which was also named after Cook's ship. Endeavour was named through a national competition involving students in elementary and secondary schools. Entries included an essay about the name, the story behind it and why it was appropriate for a NASA shuttle, and the project that supported the name. Endeavour was the most popular entry, accounting for almost one-third of the state-level winners. The national winners were Senatobia Middle School in Senatobia, Mississippi, in the elementary division and Tallulah Falls School in Tallulah Falls, Georgia, in the upper school division. They were honored at several ceremonies in Washington, D.C., including a White House ceremony where then-President George H. W. Bush presented awards to each school. Endeavour was delivered by Rockwell International Space Transportation Systems Division in May 1991 and first launched a year later, in May 1992, on STS-49. Rockwell International claimed that it had made no profit on Space Shuttle Endeavour, despite construction costing US$2.2 billion. On its first mission, it captured and redeployed the stranded INTELSAT VI communications satellite. The first African-American woman astronaut, Mae Jemison, was launched into space on the mission STS-47 on September 12, 1992. Endeavour flew the first servicing mission STS-61 for the Hubble Space Telescope in 1993. In 1997 it was withdrawn from service for eight months for a retrofit, including installation of a new airlock. In December 1998, it delivered the Unity Module to the International Space Station. Endeavour's last Orbiter Major Modification period began in December 2003 and ended on October 6, 2005. During this time, Endeavour received major hardware upgrades, including a new, multi-functional, electronic display system, often referred to as a glass cockpit, and an advanced GPS receiver, along with safety upgrades recommended by the Columbia Accident Investigation Board (CAIB) for the shuttle's return to flight following the loss of Columbia during reentry on 1 February 2003. The STS-118 mission, Endeavour's first since the refit, included astronaut Barbara Morgan, formerly assigned to the Teacher in Space project, and later a member of the Astronaut Corps from 1998 to 2008, as part of the crew. Morgan was the backup for Christa McAuliffe who was on the ill-fated mission STS-51-L in 1986. Endeavour lands after STS-127 at the Kennedy Space Center Shuttle Landing Facility. A 40-foot (12 m) diameter drag chute that reduced the orbiter's landing roll-out distance (the runway length used for deceleration) from 3,000 feet (910 m) to 2,000 feet (610 m). The plumbing and electrical connections needed for Extended Duration Orbiter (EDO) modifications to allow up to a 28-day mission (although a 28-day mission was never attempted; the record is 17 days, which was set by Columbia). Updated avionics systems that included advanced general purpose computers, improved inertial measurement units and tactical air navigation systems, enhanced master events controllers and multiplexer-demultiplexers, a solid-state star tracker and improved nose wheel steering mechanisms. An improved version of the Auxiliary Power Units (APUs) that provided power to operate the Shuttle's hydraulic systems. The Station-to-Shuttle Power Transfer System (SSPTS), which converted 8 kilowatts of DC power from the ISS main voltage of 120VDC to the orbiter bus voltage of 28VDC. This upgrade allowed Endeavour to remain on-orbit while docked at ISS for an additional 3- to 4-day duration. 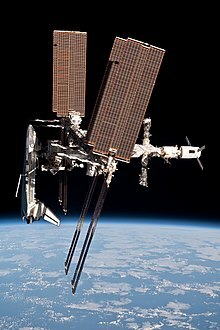 The corresponding power equipment was added to the ISS during the STS-116 station assembly mission, and Endeavour flew with SSPTS capability during STS-118. Space Shuttle Endeavour docked to the ISS for the last time. Endeavour flew its final mission, STS-134, to the International Space Station (ISS) in May 2011. After the conclusion of STS-134, Endeavour was formally decommissioned. STS-134 was intended to launch in late 2010, but on July 1 NASA released a statement saying the Endeavour mission was rescheduled for February 27, 2011. "The target dates were adjusted because critical payload hardware for STS-133 will not be ready in time to support the previously planned 16 September launch," NASA said in a statement. With the Discovery launch moving to November, Endeavour mission "cannot fly as planned, so the next available launch window is in February 2011," NASA said, adding that the launch dates were subject to change. The launch was further postponed until April to avoid a scheduling conflict with a Russian supply vehicle heading for the International Space Station. STS-134 did not launch until 16 May at 08:56 EDT. Endeavour landed at the Kennedy Space Center at 06:34 UTC on June 1, 2011, completing its final mission. It was the 25th night landing of a shuttle. Over its flight career, Endeavour flew 122,883,151 miles and spent 299 days in space. During Endeavour's last mission, the Russian spacecraft Soyuz TMA-20 departed from the ISS and paused at a distance of 200 meters. Italian astronaut Paolo Nespoli took a series of photographs and videos of the ISS with Endeavour docked. This was the second time a shuttle was photographed docked and the first time since 1996. Commander Mark Kelly was the last astronaut off Endeavour after the landing, and the crew stayed on the landing strip to sign autographs and pose for pictures. STS-134 was the penultimate Space Shuttle mission; STS-135 was added to the schedule in January 2011, and in July Atlantis flew for the final time. Endeavour docked to the International Space Station on May 23, 2011, during its final mission. After more than twenty organizations submitted proposals to NASA for the display of an orbiter, NASA announced that Endeavour would go to the California Science Center in Los Angeles. After low level flyovers above NASA and civic landmarks across the country and in California, it was delivered to Los Angeles International Airport (LAX) on September 21, 2012. The orbiter was slowly and carefully transported through the streets of Los Angeles and Inglewood three weeks later, from October 11–14 along La Tijera, Manchester, Crenshaw, and Martin Luther King, Jr. Boulevards to its final destination at the California Science Center in Exposition Park. Endeavour's route on the city streets between LAX and Exposition Park was meticulously measured and each move was carefully choreographed. In multiple locations, there were only inches of clearance for the Shuttle's wide wings between telephone poles, apartment buildings and other structures. Many street light standards and traffic signals were temporarily removed as the Shuttle passed through. It was necessary to remove over 400 street trees as well, some of which were fairly old, creating a small controversy. However, the removed trees were replaced two-for-one by the Science Center, using part of the $200 million funding for the move. The power had to be turned off and power carrying poles had to be removed temporarily as the orbiter crept along Manchester, to Prairie Avenue, then Crenshaw Boulevard. News crews lined the streets along the path with visible news personalities in the news trucks. Police escorts and other security personnel, among them including the LAPD, LASD, CHP, and NASA officials, controlled the large crowds gathered, with support from the LAFD and LACoFD to treat heat exhaustion victims as the Endeavour made its way through the city. Endeavour was parked for a few hours at the Great Western Forum where it was available for viewing. The journey was famous for an unmodified Toyota Tundra pickup truck pulling the Space Shuttle across the Manchester Boulevard Bridge. The Space Shuttle was mainly carried by four self-propelled robotic dollies throughout the 12 mile journey. However, due to bridge weight restrictions, the Endeavour was moved onto the dolly towed by the Tundra. After it had completely crossed the bridge, the Space Shuttle was returned to the robotic dollies. The footage was later used in a commercial for the 2013 Super Bowl. Having taken longer than expected, Endeavour finally reached the Science Center on October 14. The exhibit was opened to the public on October 30, 2012 at the temporary Samuel Oschin Space Shuttle Endeavour Display Pavilion of the museum. A new addition to the Science Center, called the Samuel Oschin Air and Space Center, is under construction as Endeavour's permanent home. Planned for a 2017 opening, Endeavour will be mounted vertically with an external tank and a pair of solid rocket boosters in the shuttle stack configuration. One payload door will be open to reveal a demonstration payload inside. After its decommissioning, Endeavour's Canadarm (formally the 'Shuttle Remote Manipulator System') was removed in order to be sent to the Canadian Space Agency's John H. Chapman Space Centre in Longueuil, Quebec, a suburb of Montreal, where it was to be placed on display. In a Canadian poll on which science or aerospace museum should be selected to display the Canadarm, originally built by SPAR Aerospace, the Canadian Space Agency's headquarters placed third to last with only 35 out of 638 votes. Endeavour's Canadarm has since gone on permanent display at the Canada Aviation and Space Museum in Ottawa. In August 2015 NASA engineers went to work on removing a few of the tanks from Endeavour so that they may be used as storage containers for potable water on the International Space Station. 1 1992-05-07 STS-49 39-B Edwards Air Force Base First flight of Endeavour: Capture and redeploy Intelsat VI. First three-person EVA, longest US EVA since Apollo 17. 20 2007-08-08 STS-118 39-A Kennedy Four spacewalks conducted. Installation of the International Space Station S5 Truss, of the Integrated Truss Structure. Carried a SPACEHAB module carrying 5,000 pounds of supplies and equipment to the International Space Station. Crew included the Educator Astronaut Barbara Morgan. Thermal tiles protecting the underside of the vehicle were damaged during launch. NASA decided not to fix this damage in-flight as it was not believed to be serious enough to result in loss of vehicle or crew. The craft landed a day early due to the possibility that Hurricane Dean would force Mission Control to evacuate. 21 2008-03-11 STS-123 39-A Kennedy International Space Station assembly mission 1J/A which delivered the first element of Japan's Kibo module along with the Canadian Special Purpose Dexterous Manipulator robotic arm, and the Spacelab Pallet-Deployable 1. 22 2008-11-14 STS-126 39-A Edwards International Space Station assembly mission that brought equipment and supplies in the Multi-Purpose Logistics Module Leonardo, and Expedition 18 crew rotation, Sandra Magnus replaced Gregory Chamitoff. 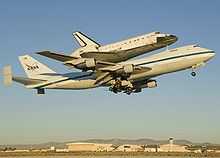 Endeavour was the only orbiter to land on the temporary Runway 4 at Edwards AFB, as the refurbished main runway will be operational from STS-119 onwards. 23 2009-07-15 STS-127 39-A Kennedy International Space Station assembly mission which delivered the last two elements of Japan's Kibo Module along with the Spacelab Pallet-Deployable 2, and an Integrated Cargo Carrier-Vertical Light Deployable. 24 2010-02-08 STS-130 39-A Kennedy International Space Station assembly mission which delivered the Node 3 and the Cupola observatory to the station. This brought the ISS to 98 percent completion. 25 2011-05-16 STS-134 39-A Kennedy International Space Station assembly mission which delivered the Alpha Magnetic Spectrometer and the ELC-3 to the space station. This was the final mission of Endeavour. Although originally planned to be the last Space Shuttle program flight, one additional flight of Atlantis, STS-135, was flown in July 2011. Endeavour is currently housed in the Samuel Oschin Pavilion at the California Science Center in Exposition Park in South Los Angeles about two miles south of Downtown Los Angeles. A companion exhibit, "Endeavour: The California Story", features images and artifacts that relate the shuttle program to California, where the orbiters were originally constructed. It has been planned for a new facility to be built with Endeavour attached to an external fuel tank (the last mission-ready one in existence as all others were destroyed during launch) and the two solid rocket boosters (SRBs) and raised in an upright position, as if Endeavour were to make one more flight. As of April 2019,[update] Endeavour is on display at the museum, the SRBs are in storage, and the external tank ET-94 is on display: ET-94 is currently undergoing restoration after being used to analyze the foam on its sister tank, which was a factor in the failure of STS-107. In the 2003 film The Core, after a geologic catastrophe, Endeavour is featured in an emergency landing in Los Angeles during an orbital mission. In the Stargate SG-1's season 2's episode 1, Endeavour rescues SG-1 from orbit after the destruction of a Goa'uld spacecraft. ^ "Space Shuttle Overview: Endeavour (OV-105)". NASA. Retrieved June 30, 2011. ^ "STS-49". NASA KSC. Retrieved June 30, 2011. ^ "Endeavour completes final mission; NASA has one left". CNN. June 1, 2011. Retrieved June 1, 2011. ^ "Consolidated Launch Manifest". NASA. Retrieved June 30, 2011. ^ John F. Kennedy Space Center – Space Shuttle Endeavour Archived 2011-05-21 at the Wayback Machine. Pao.ksc.nasa.gov. Retrieved on 2012-05-20. ^ "Shuttle's Name Misspelled On NASA Launch Pad Sign". WKMG-TV. Archived from the original on July 16, 2007. ^ 125,000 see Endeavour land: Satellite rescue highlights maiden trip. Daily Breeze. Retrieved on 2015-07-21. ^ "The Naming Of The Space Shuttle Endeavour". NASA. Archived from the original on August 23, 2011. Retrieved June 30, 2011. ^ "Shuttle Orbiter Endeavour (OV-105)". NASA/KSC. Retrieved November 28, 2012. ^ KSC, Elaine Marconi:. "NASA - Space Shuttle Overview: Endeavour (OV-105)". www.nasa.gov. ^ "Vehicle Upgrades: Station-Shuttle Power Transfer System (SSPTS)". Boeing: Integrated Defense Systems. Archived from the original on March 18, 2007. ^ "NASA Presolicitation Notice: Station-Shuttle Power Transfer System (SSPTS)". NASA. Retrieved June 30, 2011. 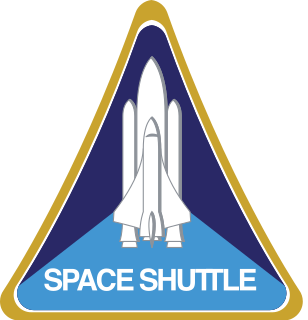 ^ "NASA's Space Shuttle Processing Status Report: S05-034". NASA. December 2, 2005. ^ "OV-105 "Endeavour"". California Science Center. Retrieved 2016-09-12. ^ NASA – NASA Updates Shuttle Target Launch Dates For Final Two Flights. NASA. Retrieved on 2012-05-20. ^ "NASA reschedules two final space shuttle launches". www.space-travel.com. Retrieved 2016-11-20. ^ "Unmanned Russian cargo ship heads for space station". CNN. February 2, 2003. Archived from the original on January 14, 2012. ^ "NASA – STS-134". NASA. Retrieved 2012-05-20. ^ "Endeavour completes final mission; one flight left for NASA". CNN. June 1, 2011. Retrieved June 3, 2011. ^ Dunn, Marcia (January 6, 2011). "Endeavour's last landing sparks pride and sadness". MSNBC. Retrieved 20 May 2012. ^ Harwood, William (June 1, 2011). "Endeavour ends final mission with smooth landing; The Space Shot". CNET News. Retrieved 2012-05-20. ^ "Soyuz TMA-20 captures historic photography prior to perfect landing". NASASpaceFlight. May 23, 2011. Retrieved 12 October 2012. ^ "STS-135: The Final Voyage". NASA. 27 July 2011. Retrieved 3 February 2017. ^ Simon, Richard (August 14, 2010). "With shuttles becoming museum pieces, cities vie to land one". Los Angeles Times. Retrieved 14 October 2012. 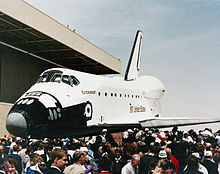 ^ "Discovery's Final Home 'Up In The Air'". United Press International. 1 November 2010. Retrieved 14 October 2012. ^ Douglas Stanglin (12 April 2011). "NYC, L.A., Kennedy Space Center, Smithsonian to get the 4 retired space shuttles". USA Today. Retrieved 14 October 2012. ^ Richard Simon (April 12, 2012). "Delivering the space shuttles is tougher than you think". Los Angeles Times. Retrieved April 19, 2012. ^ "Space shuttle Endeavour route, street closures & viewing areas". ABC7 News. Retrieved 12 October 2012. ^ Kate Mather; Adolfo Flores; Marisa Geber; Andrew Khouri; Ken Weiss (13 October 2012). "Space shuttle Endeavour rolls on toward its new home". Los Angeles Times. Retrieved 13 October 2012. ^ a b Anton, Mike (September 16, 2012). "Shuttle Endeavour's final journey is carefully choreographed". www.latimes.com. Los Angeles Times. Retrieved December 19, 2017. ^ Timon Singh (9 September 2012). "400 Trees Cut Down to Make Way For Space Shuttle Endeavour's Los Angeles Arrival". Inhabitat - Sustainable Design Innovation, Eco Architecture, Green Building. ^ CBS News (14 October 2012). "Space shuttle Endeavour's slow commute through Los Angeles". CBS News Los Angeles. Retrieved 2019-02-14. ^ a b c "Space Shuttle Endeavour homepage". California Science Center. 2012. Retrieved 13 October 2012. ^ Neal Morton (2012-10-13). "Shuttle Endeavour hitches a ride with S.A. truck". San Antonio Express-News. Retrieved 2012-10-14. ^ Allyson Harwood (2012-10-15). "How a 2012 Toyota Tundra Towed the Space Shuttle Endeavour". Motor Trend's Truck Trend. Retrieved 2013-07-17. ^ "Endeavour Arrives at California Science Center". NBC News Los Angeles. Retrieved 14 October 2012. ^ Canadian Space Agency. The Canadarm Is Returning Home Archived 2014-03-26 at the Wayback Machine, Montreal: Canadian Space Agency press release, July 16, 2012. Retrieved October 19, 2012. ^ Canadian Space Agency Requests Proposals To Display Canadarm At St. Hubert Headquarters, SpaceRefCanada website. Retrieved October 19, 2012. ^ "Endeavour's Canadarm coming home". CBC. April 12, 2011. Retrieved 14 October 2012. ^ Andy Johnson (2 May 2013). "Unveiling exhibit, Hadfield sends first Canadarm 'last command' from space". CTV News. Retrieved 2 May 2013. ^ Elizabeth Howell (2 May 2013). "Space Shuttle's Robotic Arm Goes on Display at Canadian Museum". Space.com. Retrieved 2 May 2013. ^ Canadian Space Agency (2 May 2013). "Minister Moore Unveils Exhibit for Canada's National Space Icon: the Canadarm". Canadian Space Agency. Archived from the original on 6 May 2013. Retrieved 1 July 2013. ^ "Space Shuttle Mission STS-122". Nasa.gov. May 24, 2009. Retrieved July 17, 2009. ^ NASA (November 30, 2008). "NASA RSS archive". NASA. Retrieved November 30, 2008. ^ Bergin, Chris (November 30, 2008). "Endeavour lands at Edwards to conclude STS-126". NASASpaceflight.com. Retrieved November 30, 2008. ^ "NASA – NASA's Shuttle and Rocket Launch Schedule". Nasa.gov. Retrieved July 17, 2009. ^ "STS-127 MCC Status Report No. 32". NASA. July 31, 2009. Retrieved August 1, 2009. ^ "ISS Assembly missions". NASA. ^ KSC, Kay Grinter :. "NASA - Biography of Tassos Abadiotakis". www.nasa.gov. NASA's Commercial Crew Program ". www.nasa.gov. ^ "Welcome to the California Science Center". California Science Center. ^ Branson-Potts, Hailey (April 10, 2016). "Last flight-qualified space shuttle fuel tank in existence begins its journey to L.A." Los Angeles Times. Retrieved April 20, 2019. Wikimedia Commons has media related to Space Shuttle Endeavour. California Science Center: Space Shuttle Endeavour homepage — final home in Exposition Park, Los Angeles. 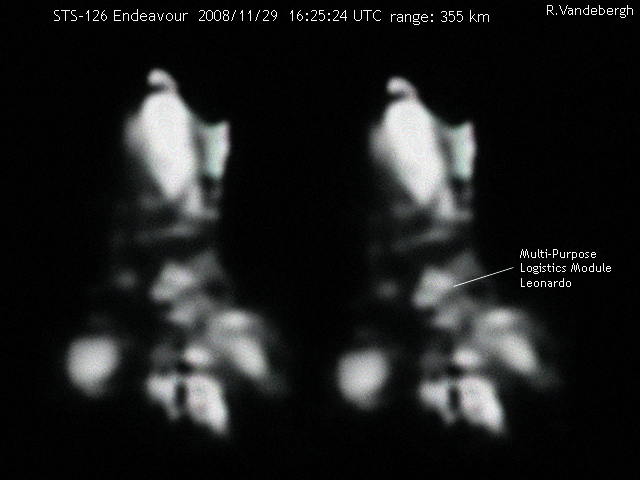 Endeavour during STS-126 mission — MPLM visible in Payload Bay. Image of Space Shuttle Endeavour docked to ISS during STS-127 — created using a telescope mounted camera by astrophotographer Ralf Vandebergh. Transition & Retirement Processing in OPF-2 — over, under, around and through Endeavour with high-resolution spherical panoramas. Consolidated Launch Manifest (2007) — Space Shuttle Flights and ISS Assembly Sequence. Space Shuttle Discovery is one of the orbiters from NASA's Space Shuttle program and the third of five fully operational orbiters to be built. Its first mission, STS-41-D, flew from August 30 to September 5, 1984. Over 27 years of service it launched and landed 39 times, gathering more spaceflights than any other spacecraft to date. The shuttle has three main components: the orbiter, a central fuel tank, and two rocket boosters. Nearly 25,000 heat resistant tiles cover the orbiter to protect it from high temperatures on re-entry. The Japanese Experiment Module (JEM), nicknamed Kibo , is a Japanese science module for the International Space Station (ISS) developed by JAXA. It is the largest single ISS module, and is attached to the Harmony module. The first two pieces of the module were launched on Space Shuttle missions STS-123 and STS-124. The third and final components were launched on STS-127. STS-88 was the first Space Shuttle mission to the International Space Station (ISS). It was flown by Space Shuttle Endeavour, and took the first American module, the Unity node, to the station. The Shuttle Remote Manipulator System (SRMS), also known as Canadarm, is a series of robotic arms that were used on the Space Shuttle orbiters to deploy, maneuver and capture payloads. After the Space Shuttle Columbia disaster, the Canadarm was always paired with the Orbiter Boom Sensor System (OBSS), which was used to inspect the exterior of the Shuttle for damage to the thermal protection system. STS-118 was a space shuttle mission to the International Space Station (ISS) flown by the orbiter Endeavour. STS-118 lifted off on 8 August 2007 from launch pad 39A at Kennedy Space Center (KSC), Florida and landed at the Shuttle Landing Facility at KSC on 21 August 2007. STS-126 was a Space Shuttle mission to the International Space Station (ISS) flown by Space Shuttle Endeavour. The purpose of the mission, referred to as ULF2 by the ISS program, was to deliver equipment and supplies to the station, to service the Solar Alpha Rotary Joints (SARJ), and repair the problem in the starboard SARJ that had limited its use since STS-120. STS-126 launched on 14 November 2008 at 19:55:39 pm EST from Launch Pad 39A at NASA's Kennedy Space Center with no delays or issues. Endeavour successfully docked with the station on 16 November. After spending 11 days, 16 hours, and 46 minutes docked to the station, during which the crew performed four spacewalks, and transferred cargo, the orbiter undocked on 28 November 2008. Due to poor weather at Kennedy Space Center, Endeavour landed at Edwards Air Force Base on 30 November 2008 at 21:25 UTC. STS-123 was a Space Shuttle mission to the International Space Station (ISS) which was flown by Space Shuttle Endeavour. STS-123 was the 1J/A ISS assembly mission. The original launch target date was 14 February 2008 but after the delay of STS-122, the shuttle was launched on 11 March 2008. It was the twenty-fifth shuttle mission to visit the ISS, and delivered the first module of the Japanese laboratory, Japanese Experiment Module (Kibō), and the Canadian Special Purpose Dexterous Manipulator, (SPDM) Dextre robotics system to the station. The mission duration was 15 days and 18 hours, and it was the first mission to fully utilize the Station-to-Shuttle Power Transfer System (SSPTS), allowing space station power to augment the shuttle power systems. The mission set a record for a shuttle's longest stay at the ISS. The Pressurized Mating Adapter (PMA) is a spacecraft adapter that converts the Common Berthing Mechanism (CBM) used on the US Orbital Segment to APAS-95 docking ports. There are three PMAs located on the International Space Station (ISS). The first two PMAs were launched with the Unity module in 1998 aboard STS-88. The third was launched in 2000 aboard STS-92. STS-134 was the penultimate mission of NASA's Space Shuttle program and the 25th and last spaceflight of Space Shuttle Endeavour. This flight delivered the Alpha Magnetic Spectrometer and an ExPRESS Logistics Carrier to the International Space Station. Mark Kelly served as the mission commander. STS-134 was expected to be the final space shuttle mission if STS-135 did not receive funding from Congress. However, in February 2011, NASA stated that STS-135 would fly "regardless" of the funding situation. STS-135, flown by Atlantis, took advantage of the processing for STS-335, the Launch On Need mission that would have been necessary if the STS-134 crew became stranded in orbit. NASA Astronaut Group 16 was a group of 44 astronauts announced by NASA on May 1, 1996. The class was nicknamed "The Sardines" for being such a large class, humorously implying that their training sessions would be as tightly packed as sardines in a can. These 44 candidates compose the largest astronaut class to date. NASA selected so many candidates in preparation for the anticipated need for ISS crew members, along with regular shuttle needs. Expedition 27 was the 27th long-duration expedition to the International Space Station (ISS), starting on 16 March 2011. Expedition 27 saw numerous notable events, including the undocking of the Progress M-09M and Kounotori 2 spacecraft, the arrival of the Soyuz TMA-21 and Progress M-10M spacecraft, and the final rendezvous with the ISS of NASA's Space Shuttle Endeavour, on its last mission, STS-134. The expedition ended on 23 May 2011 with the departure of the Soyuz TMA-20 spacecraft, although command of the station was ceremonially handed over to the crew of Expedition 28 on 22 May.